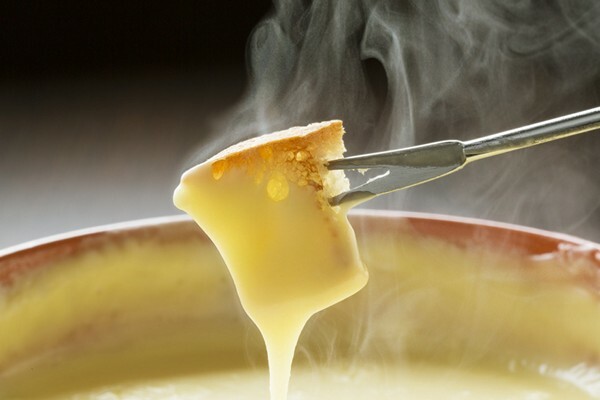 When was the last time you went to a fondue party? If you were around in the 70’s or maybe even the early 80’s it was almost de rigueur and everyone had a fondue pot. It died a sudden death shortly thereafter and wasn’t seen again until Artisanal made it chic when they opened. The Accidental Locavore and Frank were invited for a fondue party at the home of one of our chef friends, who happens to hail from Alsace. Now, when you’re from Alsace, you take your fondue very seriously and Hubert was no exception. The invitations went out two months beforehand and when we arrived Chez Hubert, there were two giant tables put together to make seating for twelve. 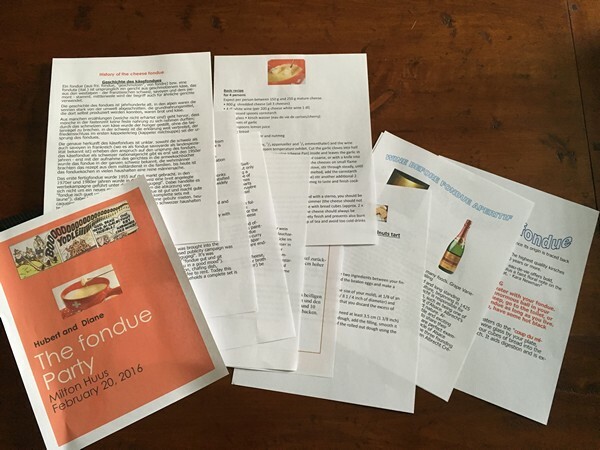 At each place was a bound folder “The Fondue Party” with the history of fondue, the evening’s recipes and wine pairings all in both German and English. And then there was Chef – Hubert, manning a flock of pots with masses of his special cheese blend, bottles of Pinot Gris and kirsh. 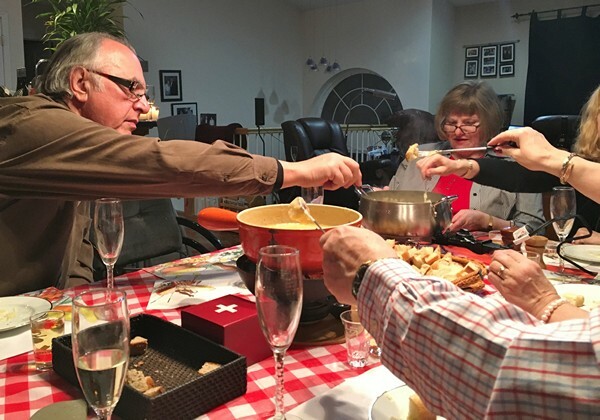 While we tried not to nibble too much on pre-fondue cheese and other hors d’œuvres, glasses of Crémant d’Alsace were poured as we all watched Hubert going from pot to pot stirring, tasting, adding and tasting. When everything was done to his satisfaction, three huge vessels were placed on the table along with baskets of various types of breads. If you think fondue is just gloppy cheese and soggy bread, you’ve never had it made by an obsessive Alsatian chef. Many miles were traveled in search of the right cheeses – a blend of Gruyere, Appenzeller and Emmental, perfect loaves of bread and complimentary bottles of wine (remember the pairing and tasting notes from the folders?). We were happily munching our way through hundreds of cubes of bread (2 cm by 2cm according to the recipe) and kilos of cheese, when Hubert switched into host mode and started pouring the wine selections. First up, an Alsatian Pinot Gris in small (almost) shot glasses. Then, with a mischievous twinkle in his eye, he whisked out a bottle of Kirsch (cherry eau de vie) from the freezer. Pouring shots for almost everyone, he proceeded to down his and insist everyone else did the same. After they finished the second bottle, they moved on to a bottle of Poire William. At this point almost everyone was fairly inebriated, the fondue pots were close to empty and we were all about to learn a very cool trick. 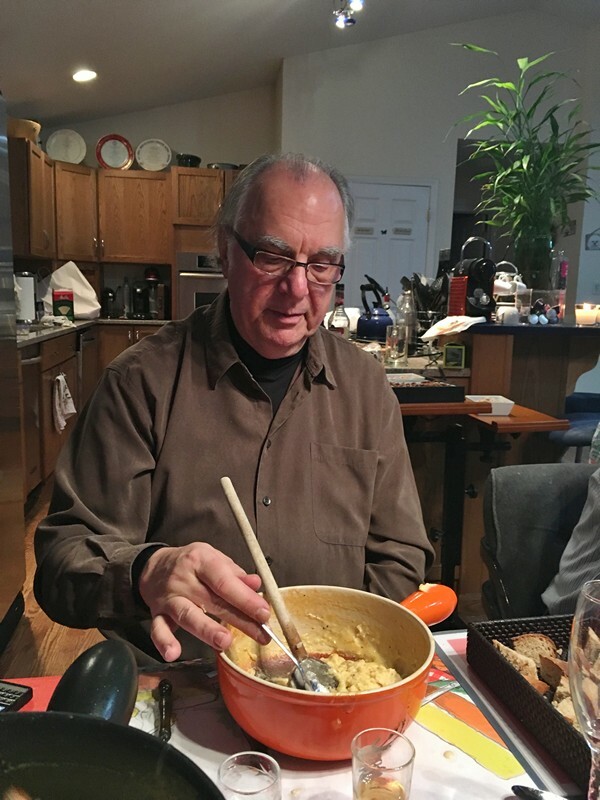 Hubert took the almost empty pots, beat a couple of eggs, added them to the pot, mixed them into the last of the fondue and handed Frank a spoon (possibly because a fork might have done damage in his state). After almost cleaning out the pot, he agreed to pass it around. The combination of scrambled eggs with the last of the fondue (including the browned bits) was incredible! Something to remember for the next fondue party. 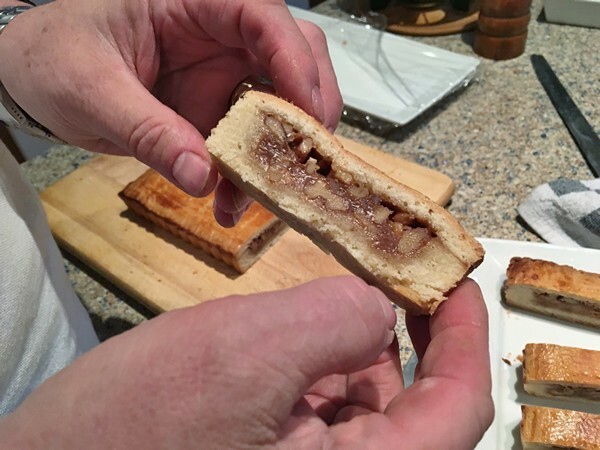 There was dessert – a walnut tart. And with it? A couple of bottles of cognac, followed by two different bottles of Armagnac. Believe me when I say that I’m one of only a couple of people who even remembers what was served. The fondue was memorable and everyone had a great time (if they’re still not sure how the night ended)! Now we all have something to look forward to when the weather gets cold again.